* Senior club appearances and goals counted for the domestic league only and correct as of 4 December 2016. Philip Anthony "Phil" Jones (born 21 February 1992) is an English professional footballer who plays for Premier League club Manchester United and the England national team. Before joining Manchester United, Jones played for Blackburn Rovers at both youth and senior levels. Although primarily a central defender, he has also been used as a right-back or defensive midfielder. Jones has represented England at various levels and is currently a member of the England senior squad. He played for the under-19 team in 2009 before making his debut for the under-21 team in 2010. He made his debut for the England senior squad on 7 October 2011. Jones was born in Preston, Lancashire and grew up in nearby Clayton-le-Woods. He attended Balshaw's CE High School in Leyland, and played for the Ribble Wanderers Under-10 side. Jones joined the Blackburn Rovers youth team in 2002. He then joined the senior team for the 2009–10 Premier League season, signing a two-year professional contract. He made his first-team debut for Blackburn after starting the League Cup game against Nottingham Forest on 22 September 2009, in which Blackburn won 1–0. Then in February 2010, he signed a new five-year contract that included a £16 million release clause. Jones made his first Premier League start for Blackburn against Chelsea on 21 March, just a month after turning 18. He was widely praised for his committed and assured performance at centre-half, making several crucial blocks and interceptions as Rovers held the champions to a 1–1 draw at Ewood Park. In the 2009–10 season, he made nine league appearances, and three cup appearances. The 2010–11 season started in promising fashion with Jones starting in the opening game of the campaign against Everton, and subsequently playing the majority of the club's games in the first half of the season, albeit in an unfamiliar defensive midfield role. A torn knee cartilage injury in a game against West Ham United in December, threatened to rule him out for the remainder of the season. However, on 19 March 2011, he made his return from injury against Blackpool at Ewood Park coming on as a second-half substitute for Brett Emerton in a 2–2 draw. On 2 April 2011, Jones started a first-team match for the first time in four months against Arsenal at the Emirates Stadium, playing the full 90 minutes in a deserved 0–0 draw. Despite his injury, he played 26 league games, and two cup games for Blackburn that season. At the end of the 2010–11 season, Manchester United were reportedly interested in signing Jones. Alex Ferguson was apparently impressed with Jones' commitment and leadership skills at centre-back when Blackburn held United to a 1–1 draw on the day United clinched the 2010–11 title. On 13 June 2011, United confirmed that they had reached an agreement to sign Jones on a five-year deal for an undisclosed transfer fee believed to be at least £16.5 million; the deal would be finalised upon his return from international duty. He made his debut for the club on the 2011 pre-season tour to the USA, in United's 3–1 victory over Chicago Fire. 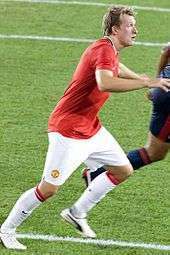 Jones made his competitive debut for Manchester United as a second-half substitute, replacing Rio Ferdinand in the FA Community Shield clash against Manchester City. United were 2–0 behind, but won 3–2 over rivals Manchester City in the 2011 Community Shield. Jones made his league debut a week later, again as a substitute replacing Ferdinand, as United beat West Bromwich Albion 2–1 on the opening weekend. He made his full Premier League debut on 22 August 2011 against Tottenham Hostpur in a 3–0 victory at Old Trafford, playing the entire game alongside Jonny Evans. On 10 September 2011, Jones provided two assists for Wayne Rooney in United's 5–0 thumping of Bolton Wanderers at the Reebok Stadium. He played the entire game at right-back and created Rooney's first goal after a quick throw in and pin point cross for Rooney to tap home. Then five minutes later, Jones embarked on a mazy dribble going past numerous Bolton defenders before his shot was blocked by the goalkeeper but followed up by Rooney. Jones made a similar type of run in United's next game at home to Chelsea, when he got into the box and caused panic in the Chelsea defense, before the ball ricocheted to Wayne Rooney to score. United went on to win the game 3–1. Jones started the away game to Liverpool as a box to box midfielder, different from his usual centre-back and full-back positions he was accustomed to. On 22 November 2011, Jones put through his own net in the opening minutes against Benfica in a UEFA Champions League group stage match; a deflected ball was fired across the six-yard box and Jones was unable to adjust his feet in time; the match ended in a 2–2 draw. Jones scored his first ever senior goal on 3 December 2011, in a 1–0 away win against Aston Villa. He arrived in the box from centre midfield to meet a cross from Nani with a controlled side foot volley to score the game's only goal. Jones scored a consolation goal against Basel in a 2–1 Champions League defeat that resulted in United being knocked out of the competition, heading in a loose ball after Federico Macheda's shot had come back off the bar. On 21 December 2011, he suffered a facial injury in an away match against Fulham, however the X-ray showed no serious damage and Jones returned to action in the 3–2 defeat against Blackburn on 31 December. Jones scored an own goal in their 3–0 loss to Newcastle United on 4 January 2012. After suffering a back problem and having a knee operation which kept him out for the start of the 2012–13 season, Jones made his first appearance in an away match against Galatasaray in the UEFA Champions League on 20 November. He made his first Premier League appearance on 28 November 2012, replacing Anderson in the 84th minute of a 1–0 win at home to West Ham United. He scored his first goal of the 2013–14 season on 29 October in a 4–0 win against Norwich City in the League Cup. On 10 December, he scored the only goal of the game in a 1–0 win against Shakhtar Donetsk in the final group-stage game of the UEFA Champions League, ensuring Manchester United finished top of the group. On 1 July 2015, Jones signed a new four-year contract with Manchester United. Jones made his debut for the England under-19 team in the 3–1 win over Turkey on 17 November 2009. He has since appeared a further three times for the under-19s. On 4 August 2010, Jones was called up to the England under-21 squad. On 10 August, Jones won his first under-21 cap, starting for England against Uzbekistan. He was substituted in the 46th minute and was replaced by Liverpool's Martin Kelly. He was selected for the 2011 U-21 European Championship in Denmark and was made captain by manager Stuart Pearce for the final group stage game against the Czech Republic. On 5 August 2011, he was called up to the England first-team squad for the friendly against the Netherlands by Fabio Capello, but did not end up playing as the game was cancelled four days later by the Football Association after riots in London. On 7 October 2011, Jones made his debut for the England senior team in a 2–2 draw against Montenegro in UEFA Euro 2012 qualifying. After the game, Capello said Jones was "born with talent", and praised his performance. Jones was named in England's UEFA Euro 2012 squad by Capello's replacement Roy Hodgson. However, he did not make an appearance during the tournament. On 12 May 2014, Jones was named in England's 23-man squad for the 2014 FIFA World Cup. Due to a shoulder injury, Hodgson took uncapped defender John Stones as standby for Jones, but he recovered before the 2 June deadline. With England's elimination likely, Jones was given a tournament debut as a starter in the final group match, helping the team to a clean sheet in a 0–0 draw with Costa Rica in Belo Horizonte. Known for his physical power and build, Jones has been called a "jack of all trades" for his ability to play at centre-back, at right-back or as a defensive midfielder. Despite the suggestion that his best position is centre-back, he often fills in at right-back. With his stocky build, opposition players have found it hard to bully Jones off the ball or out-muscle him. Manchester United legend Sir Bobby Charlton has said that Jones evoked memories of the late Duncan Edwards, "If you talk to Bobby Charlton," says Paddy Crerand, Charlton's team-mate in United's 1967–68 European Cup-winning team, "Phil Jones reminds him of Duncan Edwards with his power and build." In 2011, then England manager Fabio Capello compared Jones to former Milan and Italy captain Franco Baresi, and former Real Madrid and Spain captain Fernando Hierro. In 2013, Sir Alex Ferguson said of Jones, "Arguably, the way he is looking, he could be Manchester United's best ever player." Jones caused mass outrage after posting a Twitter "tribute" on the anniversary of the Munich air disaster containing personal branding advertisements. 1 2 Hugman, Barry J., ed. (2010). The PFA Footballers' Who's Who 2010–11. Edinburgh: Mainstream Publishing. p. 226. ISBN 978-1-84596-601-0. ↑ "Manchester Utd Player Profile". manutd.com. Man Utd. Retrieved 24 May 2016. ↑ "Multi-million pound teen". Leyland Guardian. 19 June 2011. Retrieved 2 December 2012. ↑ "Balshaw's C.E. High School, Leyland". Balshaw's CE High School. Retrieved 2014-05-12. ↑ "The 'humble young lad' who grew up to be a football star". Lancashire Evening Post. Preston. 2011-06-15. Retrieved 2014-05-12. ↑ "Manchester United secure deal for Blackburn's Phil Jones". BBC Sport. 13 June 2011. Retrieved 13 June 2011. ↑ "Jones Signs 2-year Deal at Rovers". Blackburn Rovers F.C. 4 September 2009. Retrieved 23 September 2009. ↑ "Nottm Forest 0–1 Blackburn". BBC Sport. 22 September 2009. Retrieved 22 September 2009. ↑ "Manchester United set to complete £16m deal for Blackburn's Phil Jones". The Guardian. London. 8 June 2011. Retrieved 8 August 2011. ↑ Ashenden, Mark (21 March 2010). "Blackburn 1–1 Chelsea". BBC Sport. Retrieved 21 March 2010. ↑ "Hoilett heroics rescue Rovers". Sky Sports. 19 March 2011. 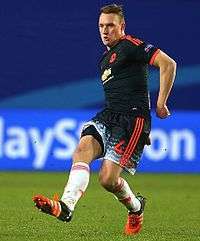 ↑ "Blackburn defender Phil Jones faces lengthy absence". BBC Sport. 21 December 2010. Retrieved 22 December 2010. ↑ Smith, Rory (14 June 2011). "Manchester United celebrate Phil Jones transfer triumph but Blackburn claim to have secured inflated fee". The Daily Telegraph. London. Retrieved 30 August 2011. ↑ Bostock, Adam (13 June 2011). "United seal Jones deal". Manchester United F.C. Retrieved 13 June 2011. ↑ Coppack, Nick (23 July 2011). "Chicago Fire 1 United 3". Manchester United F.C. Retrieved 24 July 2011. ↑ Bevan, Chris (7 August 2011). "Man City 2–3 Man Utd". BBC Sport. Retrieved 7 August 2011. ↑ Chowdhury, Saj (14 August 2011). "West Brom 1–2 Man Utd". BBC Sport. Retrieved 15 August 2011. ↑ Da Silva, Michael (10 September 2011). "Bolton 0–5 Man Utd". BBC Sport. Retrieved 11 September 2011. ↑ "Jones surprised by midfield role". Sky Sports. 16 October 2011. Retrieved 16 October 2011. ↑ "Aston Villa 0–1 Man Utd". BBC Sport. 3 December 2011. Retrieved 3 December 2011. ↑ "Defender Phil Jones delighted to be back in action for Manchester United". Sky Sports. 21 November 2012. Retrieved 28 November 2012. ↑ "Manchester United 1–0 West Ham". BBC Sport. 28 November 2012. Retrieved 28 November 2012. ↑ "Manchester United 4–0 Norwich City". BBC Sport. 29 October 2013. Retrieved 10 December 2013. ↑ "Manchester United 1–0 Shakhtar Donetsk". BBC Sport. 10 December 2013. Retrieved 10 December 2013. ↑ "Phil Jones signs new Manchester United contract until 2019". BBC Sport. 29 June 2015. Retrieved 1 July 2015. 1 2 "Phil Jones". The Football Association. Retrieved 5 August 2011. ↑ Bradbury, Jamie (10 August 2010). "Rose and Kelly on the mark". The Football Association. Retrieved 22 December 2010. ↑ Tongue, Steve (21 June 2011). "England Under-21s lack character and creativity". The Independent. London. Retrieved 5 August 2011. ↑ Austin, Simon (5 August 2011). "Man Utd defender Phil Jones included in England squad". BBC Sport. Retrieved 5 August 2011. ↑ "England match against the Netherlands off after riots". BBC Sport. 9 August 2011. Retrieved 9 August 2011. ↑ Winter, Henry (8 October 2011). "Capello praises United's Phil Jones". The Daily Telegraph. London. ↑ Samuel, Martin (26 June 2012). "Why did Roy give up on the Baresi of England?". Daily Mail. London. Retrieved 8 May 2014. ↑ "World Cup 2014: England name Ross Barkley in squad". BBC Sport. 12 May 2014. Retrieved 25 June 2014. ↑ Orr, James (12 May 2014). "England World Cup squad announcement: 'John Stones will replace Phil Jones if he is not fit by 2 June,' say Roy Hodgson". The Independent. London. Retrieved 8 September 2014. ↑ Taylor, Daniel (24 June 2014). "England end disappointing World Cup with barren draw against Costa Rica". The Guardian. London. Retrieved 25 June 2014. ↑ "Phil Jones' new deal at Man United proves Louis van Gaal's faith in him". Musa Okwonga. ESPN FC. 30 January 2015. ↑ "Jack of all trades, master of none". ESPN FC. 22 March 2012. ↑ "Phil Jones nullified Everton's main threat, says Robbie Savage". BBC Sport. 10 Feb 2013. ↑ "Real Madrid v Manchester United: Phil Jones and Jonny Evans back in training boosting Alex Ferguson's options". The Daily Telegraph. London. 12 February 2013. ↑ "Manchester United's Phil Jones: it's flattering to be compared with Duncan Edwards". The Daily Telegraph. London. 1 October 2011. ↑ "England manager Fabio Capello says Phil Jones reminds him of Franco Baresi and Fernando Hierro". The Daily Telegraph. London. 17 November 2011. Retrieved 8 May 2014. ↑ "Premier League: Sir Alex Ferguson praises Manchester United's Phil Jones". Sky Sports. 23 April 2013. Retrieved 8 May 2014. ↑ "Fans vent fury at Phil Jones after Munich air disaster Twitter gaffe". Irish Independent. Dublin. 7 February 2016. Retrieved 28 February 2016. ↑ "Games played by Phil Jones in 2009/2010". Soccerbase. Centurycomm. Retrieved 10 April 2016. ↑ "Games played by Phil Jones in 2010/2011". Soccerbase. Centurycomm. Retrieved 10 April 2016. ↑ "Games played by Phil Jones in 2011/2012". Soccerbase. Centurycomm. Retrieved 10 April 2016. ↑ "Games played by Phil Jones in 2012/2013". Soccerbase. Centurycomm. Retrieved 10 April 2016. ↑ "Games played by Phil Jones in 2013/2014". Soccerbase. Centurycomm. Retrieved 10 April 2016. ↑ "Games played by Phil Jones in 2015/2015". Soccerbase. Centurycomm. Retrieved 10 April 2016. ↑ "Games played by Phil Jones in 2015/2016". Soccerbase. Centurycomm. Retrieved 6 September 2016. ↑ "Games played by Phil Jones in 2016/2017". Soccerbase. Centurycomm. Retrieved 6 September 2016. ↑ "Jones, Phil". National Football Teams. Retrieved 10 April 2016. 1 2 "P. Jones". Soccerway. Perform Group. Retrieved 10 April 2016. Wikimedia Commons has media related to Phil Jones.